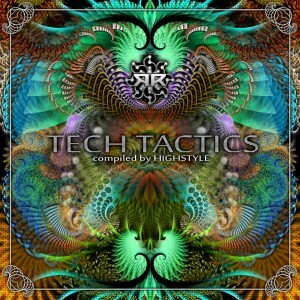 Prepare your ear canals for Ritual Records‘ next compilation, Tech Tactics, compiled by HighStyle. Featuring the freshest, proudly South African, high-tech darkpsy, psycore, and night-time gems. Featuring full-frequency blasters from Paralocks, Killawatt, Fright Rate, HighStyle, Organoise, Neonglo, Telepathy, Gamba, and Anubis. Elevate yourself to a higher frequency with clean psychedelic synths and fx, relentless low-end, and fast-paced rhythms. This is another fresh release not to be missed! Cover art by Jerry Van Den Heever (A.K.A Paralocks). Mastered by Dash Hawkins (A.K.A. Glitch). MP3 Download | FLAC Download | WAV Download · Download count: 15,266. My homies! Been looking forward to this one. Thanks :) looks nice will listen !!!!!!!!!!! I died & was reborn. Excellent points altogether, you just gained a emblem new reader. What may you recommend in regards to your submit that you just made some days ago? Any positive? Juicy and engulfing, like a typical danceable high-tech song should be. This is a song that can easily be applied on dance floors. The beat in the background changes off and on, keeping the flow going. Robot gargling synth textures chew up and spit out the bass occasionally and glitch things up, offering some interesting qualities that make this track unique. Well mastered, clean, well done. Great theme with the vocals about drugs. This has a great buildup and intro, continuing a danceable, high energy mood left from the last track. Again, well chosen voice sampling is used for a great atmosphere. My head and heart cant stop bobbing to this fast paced action scene. There is a lot more percussion elements used here, adding a few extra enjoyable layers of sound. I can definitely hear the well mastered attitude here as well. Props to the clear quality! That is needed for DJs. I now realize everyone is using kickass vocals here. I love that, it really adds that super special “this music is awesome” factor. Like the first two tracks, Machine Music is intense and fast paced. It does, however, have the best buildup I have heard in this album, so far. It lets you take a breath right before it says “the correct answer is” and moves right back into heavy technical dance psy. Staying true to the original theme of the album, it pushes things a bit farther and puts a smile on my face. “Everyone knows thats what aliens sound like” hahah! Like the other tracks, Alien Alphabet is fast, clean, action packed, vocal injected, and energetic dance music. Any psycore loving club would enjoy this piece, certainly shredding the darkness with glowsticks and approving shrieks. Personally, I find the track to be extremely similar to the others, so there is not much else I can say. However, this is a good thing because if you love the others, you will love this. It seems these artists have come together to create this quick and fast style. The synth riffs are very well done in this track! The melody is perfect, includes some classic 8-bit instruments, and everything climaxes around the 7 minute marker to plant an exciting body throbbing seed of euphoria in my brain. This is what I expect technical, high energy music to do. Nothing is overdone in this track, its the best one I have heard so far. A very good mix. It moves like a professional dancer, where everyone cant help but keep staring. I thought the doorbell used was pretty clever. The artist seems to like putting in neat sound effects rather than vocals. I also noticed the use of rising pads in many areas. I really enjoyed how these pads carried the progression. The small sections of melodic harmony were really kickass. The bass keeps the same tone throughout the track, however. It would be nice to switch it up a bit against the constantly changing synths. Overall, this song had an excellent soundest and followed the normal high energy psycore style this album expresses. Many high frequencies rattle my head in this track, but they are mixed well with a few relaxed, slower tempo moments that made areas like 4:10 even better. Masterful progression and mixing. I usually hate all high frequencies, but this track places them all around my head and uses a decently changing bass tempo. It would be nice to see a better mix of frequencies, however. The constant zips and zaps give me a headache at times. Don’t get me wrong, I just would like to see more of a variety in here. This track has more of those lows needed to move the driving high frequency leads. I enjoy this track a bit more than the others simply because it innovates the style rather than repeat it. It builds many different sounds across different climaxes and buildups, surprising me at points. I love to be surprised. I dont want to expect what zippety zap comes next, because that gets boring. This is a very enjoyable track, carefully choosing what hypnotizing synth bombardment to release next. Engulfing and juicy. Well done! Another quality piece here. The sounds used in this track remind me of playing Earthbound. That changing baseline is a very nice touch. Organized, to the point, fast buildup, good climaxes, and an overall easily danceable psycore track. I enjoy the melody used at 2:50. It is considerably quirky and interesting. I find this track to be the best on the album. The starting bass immediately capture my attention. It is low and steady, crystal clear and sinister, and exciting. If I could pick a track that put together all of the ideas and visions expressed in this collaboration, it would be this one. It doesn’t overdo the zaps and whistles. It has a seemingly perfect foundation, including all these great sounds and glitches. It stops and starts at all the right moments, bringing in “wikki wikki”, a downtempo segment, and orgasmic finales. If I would play any of these at a club or save them in my favorites folder, this would be my first pick. Good job! Another similar track with a lot of beat mashing, synth bending, and video game bit sounds layered underneath vocals. Still, it is well mastered, well done, and clear, but it lacks a special innovative, varied touch. It stays with a constant beat, predictable progression, and extraordinarily similar instruments. It is almost as if everyone in the collar is using the same program with the same sounds. Mindmatter is a good track, but I feel the similarities between it and the other tracks makes it boring for me. That isn’t each individual artists fault, its just the simple fact that all of these same ideas are placed together into one long album. Its easy to understand the style after the third song. Then it gets too predictable. Zippety zaps, xippity zoos, zappady waddas, and other collections of electrifying, jolting intensions of hard high end synths lead every song in Tech Tactics. Simply energizing, the 180+ BPM of each track is sure to make anyone want to dance. It can defintley explode crowds, twisting their bodies all over the dance floor. If you like the first track, your going to like the second, and your going to like the third, and fourth, and every other one after that. There isn’t very much variety in here, however each piece is well mastered, powerful, fast-paced, explosive, and intense. The solid bass textures can easily shake you and move you. If you are looking for more variety, then most of this album is not for you. It has picked a series of quality psycore tracks that follow the same attitude with a lot of extremely similar, heart-attack inducing, energetic synth leads. Although, there are a few unique innovations in here that go beyond the typical theme presented. String Theory, being one of them, is my favorite track on here. I strongly recommend each artist take a listen to the album and try to think outside the box… what else can you do to capture the attention of listeners? What methods should be used to add variety? I would suggest slowing down things at points, adding more ambience and unexpected drops to really buildup suspense and then hit it hard with some good ole energetic psycore! Its all about the euphoria. Keep in mind, this is my opinion, but I feel there is still a lot of room for improvement in terms of developing your individual styles! Keep up the research and production guys. (8/10) I am starting to leave a review score on my reviews, since this is typically what people look for to start with. This mp3 link is broken. dont know about the other links. pls fix. Another ridiculously killer compilation from Ritual. They put every other label to shame with quality control like this.